The past ten years we worked very hard. Now there are still a few trains to be setup, but it is almost ready. Then we have time to improve the existing services and to look for new challenges. 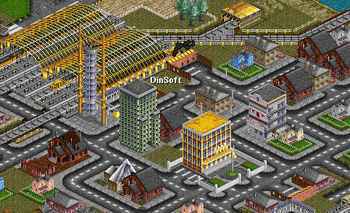 Dinsoft has now almost 1300 inhabitants and seems to be in a wealthy condition. There are still new buildings under construction. One of our competitors made a truck station near a food processing plant. After some time they demolished it, and now there is 306 tons of food waiting for transport. This will never happens, the food is lost forever. Since the reliability of the Lev2 is very good, we replaced already several locomotives, Lev1 with the better and faster Lev2. There is a farm with a very high production and the competition tried already several times to start a transport service from this farm to the closest food factory. One has managed to make a railroad, another one tries now to do so. Don't worry; they will never get a train running, they have no money for the train. The train income was very good, but due to our new vehicles we have a loss of almost 50 million dollars. All the big jobs are done, now we can have a look to make some small improvements and to see if we can get some subsidies. February 1, the first small change was made: the train between Condinghall and Wrunthill City goes now a bit further, to Pennville North. March 15 we got the first bad message: an insect problem in Tenington Forest. The wood train there earns yearly about 1.5 million dollar. This will be a lot lower this year. The farm at Fronthead Woods has a very high production. The rating at the station is around 50 percent. Therefore on October 13 an extra train is added from this station to the Food Processing Plant at Frondhead East. November 15, the production from the Slarfingfield coalmine will be doubled, we have already one coal train here, so no action is needed. November 15, a subsidy offered for gold transport from Kendhattan Gold Mine to Gadtown bank. This was already a few times done by a competitor, but the production is to low to earn money on it, so we don't do anything. Earnings are a bit higher then last year, but not enough to compensate the inflation. We replaced a lot of Lev1 with the newer and better Lev2. For the rest we go to look around to see if all goes well and if improvements can be made. Now we can spend our time to improve small things, like the railroad at the left, not so very good made. Well, September 10, we've made it all straight through. WWW Transport has also ten road vehicles. They don't make so much money, but they are nice to look at. When they are old, they have to be replaced. This is also an important job. This year we will start with replacing the Lev1 with the Lev2 trains. This will increase our income and give our company a higher rating in the cities. Each locomotive will cost us about 7 million dollar. We have two Armored trucks, transporting gold from Tatfield Gold Mine to the bank in Nardinghattan Bridge. As you can see, they lose money. The transport rating is only 33%. To improve, we go to run a train between Nardinghattan Bridge and Dinfingway, with a stop near the gold mine. We will make a new Train service between Nardinghattan Bridge and Tatfield and also the one between Dinfingway and Ronwood. June 30 the first new train arrives at the new station near the gold mine. The train stops only on its way to Nardinghattan Bridge. First earning: 250 thousand dollar. Our business is going well. On all station our rating goes from very good to excellent. All our 79 locomotives are now model Lev2. It is time to start some other business. We go to make a boat service from Lendhead to Kendhattan. After a few weeks the boat service is up and running. January 21 the first boat arrives at Kendhattan. After a few weeks they started to earn some money, about 40.000 dollars in total. When we looked around to all the railroad station, then one was found where the transport rating was 69%. Now is this not so bad, but since we want to improve things, we started a bus and a Mail service to the neighbor station. March 13 it was in full operation. Also in Ronwood is our rating below 70%. Also there we go to make an extra bus service, now from Ronwood to Slunningpool. As can been seen, there are over 100 passengers waiting on Ronwood railroad station. The first bus arriving at Slunningpool (April 12) earned about 6000 dollars. A similar situation was found in Runwood. There it is not so easy to make a bus service, but the train itself could be made larger. We added to mail vans and an extra passenger car. May 24 the rating was already improved to 70% for passengers and 69% for mail. It still goes up, so we go to look around to make some more improvements. Also the ratings in Slindwood were below the 70%. In Slindwood west the situation was even worse: no passenger service at all. So a bus service was made between Slindwood and Slindwood West. This does not make a lot of money, but it improves our ratings. In the mean time on July 14, we got a message that more coal was found and that the production of the Chunborough Coal Mine is expected to double. This is good news, but we have to make sure that all the coal can be transported. All stations are inspected and found to have a good transport rating. However, there is one more station with a bad transport rating that is Senfingley Woods. 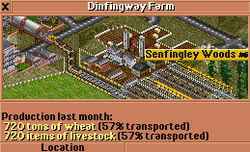 There is a farm with a very high production and only 57% is transported. We go to improve the railroad: shorter and no level changes. October 20, it is ready. Now the two trains do have each there own track, without level change and without any signs. Let's see if it will improve. We did not spend so much money last year, so the bank balance increased from 377 million to 481 million dollars. There is plenty money to invest in new transport business, but now it is not so easy to find some good places. Since there is not so much need for new trains we first have a look if all trains makes money. It is interesting to see that there is sometimes a large difference, for example train 7 and train 10. One makes only $63k and the other almost 3 million. To increase the earnings of train 7, we remove some Coal cars. Now there are four left and it seems to give some improvement. 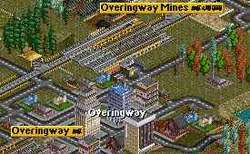 In the mean time we had a look to Overingway, the city where the coal mine is located. There are two large railroad stations, both only partial used. The best solution is to remove one and to combine the coal transport with a passengers train. The transport rate of the coalmine is now 87%. The earnings of the two trains about 2.4 million. We will see if this change after the reconstruction. July 2035 the new train is running from Overingway to Lendhead Central. The first earnings are 80.000 for the coal and 60.000 for the passengers and mail. At the end of October 78% of the coal is transported. Not so bad. Since Overingway is located at the sea, it is very suitable for a boat service, for example to Pennville. November 16 the new Hovercraft arrives at Overingway and takes 20 passengers from the new terminal. The arrival of the boat was on December 5. It could not find the shortest way. Therefore now we placed several buoys between Overingway and Pennville. Now it should go much better. February the first we got an offer to buy a new model locomotive, the LEV3, Pegasus. We take this offer, but we won't update all our existing trains but any new train must have the latest model locomotive. Updating all trains will cost a lot of money and all our locomotives are almost new. Most of them are not older then five years. The Hovercraft between Overingway and Pennville is doing very well. It is always fully booked and several passengers are waiting for the next trip. It will be good to put a second boat in service. The first of July we got some messages about a company in trouble and about an infection on a farm that causes a lower production. We have no transport from that farm, so there is nothing to worry. Close near this farm are two railroad stations, one for a coalmine and the other one for a gold mine. It will be good to reconstruct these stations to one station and also decrease some level changes in the railroad to the coalmine. A bit more income from the trains, but relatively a lot more from our boats. So the total income was increased by 8 million dollars. The bank balance is almost 700 million dollars. We are continuously looking for places that need to be improved. One of them is the situation on Frondhead East, only about the half of the produced food is transported. This is a terrible situation. Therefore on April 16 a second train was put in operation. Earnings on the first trip already 110.000 dollars. For many years there was a subsidy offered for gold transport from Kendhattan Mines to the bank in Gadtown. Many times there are messages from landed UFO's. This is very frustrating, it is not the UFO that causes the problem, but they are automatically destroyed by the Air Force. They drop just a big bomb and that destroys also the railroads. Here is the same location after the bomb was dropped. The rails and the depot are completely vaporized. We have to repair everything immediately. If we don't do, it will cost us a lot of money. In September we got the subsidy for the gold transport. It is done with two Foster Armored trucks. Also the road was modified to avoid same level crossings with the rail road. This gives sooner or later a crash. Well we did spend a lot of money and it is not sure if we get some back. Another 100 million more on the Bank Balance. It becomes time for some new investments. However, it is more and more difficult to setup new money making services. All good services are already made. On January 4 we have already a problem. Our holiday helicopter is getting old. Normally we replace it by a new one. However, all helicopters are out of production, there are no new one's anymore. When we use an airplane, then their needs to be a real airport at Ledinghattan. The first of April all locomotives are replaced by the LEV4. The Bank Balance is only 160 million dollars. We've spent 681 million dollars on new vehicles. It can be seen in the graph that during the replacement period the income dropped down sharply. Well we can be sure that it will go up very soon. The LEV 4 is a very new model and, as you can see from the details of train 1 the reliability is still very low for this new locomotive. It is only 41 %. After a few years, when all the specific problems are found and analyzed this will increase a lot. There was a very long time a competitor Murphy & Co, with one Road Vehicle. Well, that car has a crash with a train, so there is nothing left. Our new trains are so very fast that you can't see them anymore. October starts with bad news about Higgins & Co - bankrupt and Flondston transport - for sale. It is not useful to buy such a company, because they have absolutely nothing, but a million dollars high loan on the bank. The previous year we did spend a terrible lot of money on new vehicles. This year it is time to make some money. Since we sold our helicopter, because it was too old, we had no airplanes. What is a transport company without airplanes? No nothing. 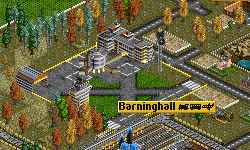 Therefore we had a look around and found a good place for a second airport, near Barninghall. There is a large flat area with already a good infrastructure and it is close to a large city. A good place to build a new airport. Then we got this terrible message, so we cannot buy a new aircraft. Solution: we sell Road Vehicle 6, a money losing bus. Losses last year 64 thousand dollars. April 15 the bus is sold and the new aircraft arrives on Barninghall airport. The setting of the aircraft is "Full Load" so it waits till all the passengers are boarded. May 20 it arrives on Dinsoft Airport and the earnings are only 73 thousand dollars. Not that much, but maybe it will improve in the future. Road Vehicle 7 was losing money, and, while watching what it does it was hit by a train. The new trains are now so terrible fast that they are almost invisible. There is absolutely no time to stop. Now the company starts to likes aircrafts. Therefore we started a new service, form Tindhall to Dinsoft. The aircraft is a Dinger 1000, a very fast one. Hopefully it goes to make some money. We should not go bankrupt on our hobby. In October the plane is in operation. First earning: 365,000 dollars. Another decade finished. WWW Transport has now 79 trains. The company value raised in ten years from 722 million to 1,378 million dollars. We do have different kinds of transport vehicles: trains, cars, aircrafts and boats. We transport all kind of goods, business is going well.